The Altura Podium Elite Thermo is a performance orientated cycling jacket which has been designed to be sleek and form-fitting. Made from super-warm, Altura Thermo™ fabric the Podium Elite is engineered to maintain core thermoregulation, keeping you warm, dry and comfortable. With an Altura ErgoFit™ 3D pattern fit engineered for a more comfortable riding position the Altura Podium Elite Thermo cycling jacket includes a slightly dropped tail to ensure you remain fully protected even when you’re tucked down in an aggressive cycling position; packed full of user-friendly features this capable cycling jacket has five pockets on the rear as well as a zippered pocket for secure storage of your keys or phone. 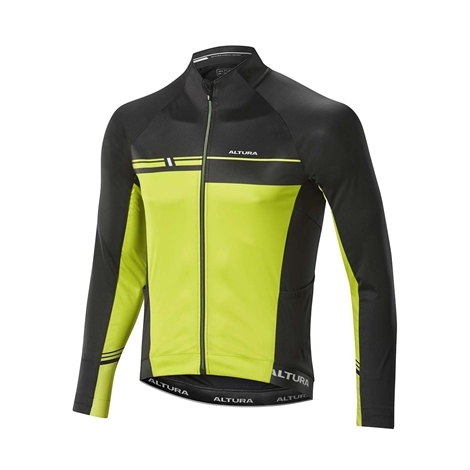 Available in black and red or hi-vis yellow and black the Podium Elite jacket includes reflective detailing to help you stand out to other road users at night time.